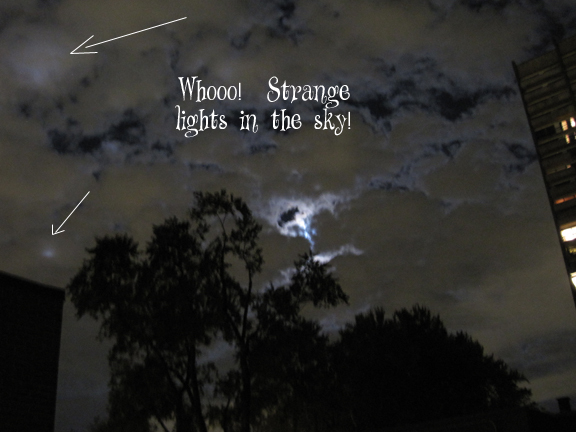 The other night I was outside our house and noticed there was something strange about the sky. Lights. Odd little lights going in all directions. Not the same as spotlights - no beams or discernible pattern to them. 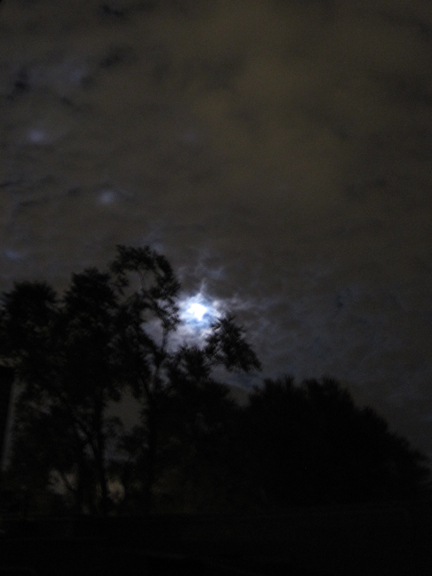 Random lights shooting across the night sky and there appeared to be neither rhyme nor reason! Cool! Just for fun I Googled "Lights, sky, Montreal" to see what event I was missing downtown, and what do you know......this wasn't the first time this had happened and my Google search took me to UFO sites. Did you read this? UFO SITES! Of all the towns in all the world the aliens had to come to mine. Again, cool! Wouldn't that be something!?! This was fun to watch but it's kind of weird to think people can be so, how shall I put this nicely.....willing to believe? It makes me nervous when people would rather think UFOs are hovering than just use their heads and work out a rational explanation. (These 'UFOs' didn't mind me taking some photos. As a matter of fact, they totally ignored me. That can't be right)! MacLeans Magazine posted a little article on strange lights over Montreal in September, 2010. The CBC also did a piece. Apparently the police received a lot of calls about the lights. Why? What are the police going to do? If you think aliens are landing, forget the police. No amount of tickets are going to keep aliens off your street.If there are ETs out there that are so sophisticated they can sweep across our night sky just for fun, get out your tin foil hats. As a matter of fact, you might want to keep several rolls of aluminum foil in your survival kit just in case. Personally I'd love to have aliens land in Montreal. Friendly ones that is. Wouldn't it be fine to have a superior intelligence land and solve all our problems? Especially if they look like ET, my very favourite alien. Well, the skies have cleared, the lights gone, so life as we know it goes on. I laughed through this I agree what would the police do? LOL To be on the safe side though I am going to stock some tin foil. You probably will not get the nice friendly ET type of alien if they ever land. Our planet is not exactly at the centre of the galaxy, we are way out in the boonies. The most we can hope for are some teenagers who borrowed their parents spaceship and went off to the wilds to have a bush party where noone would notice. It's true, our planet is out in the boonies and alien teenagers can probably be as wild as human teenagers. Too bad. ET was so cute.